We are excited to announce our Fall Workshop Schedule. If you have ever wanted to get a hands-on, creative experience with setting type, carving linoleum or making your own letterpress prints, these workshops are for you! Details are below. Register now by e-mailing shelly@frenchpressonline.com or tony@typehigh.com or calling 585-406-0537. Spots are limited and will fill fast. Private workshops or lessons are also available. Please contact us for more information. This class will introduce the basic skills of linoleum block printing (linocuts) from designing your image, cutting your block and printing. Choose to base your imagery on Autumn or Halloween...or whatever you wish. Students will leave with 10 prints (you may also bring in items to print on). A perfect course for beginners or those wishing to refresh their skills. 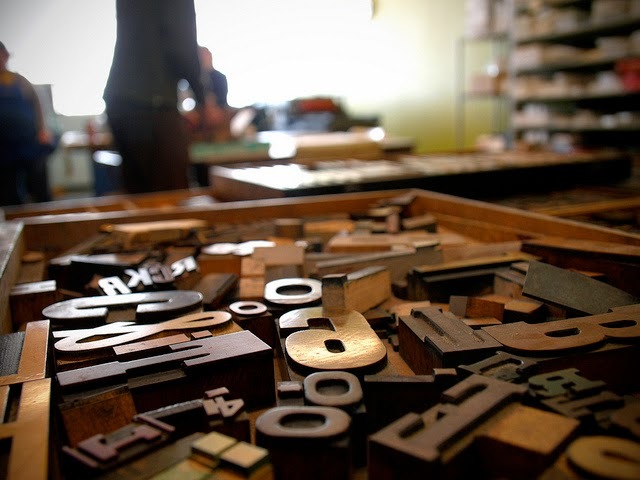 This class will introduce the basic skills of letterpress printing — layout, hand setting type, mixing inks, and printing. Students will leave with 10+ prints (you may also bring in items to print on). A perfect course for beginners or those wishing to refresh their skills. A very 'open' class format allowing students to work either with our wood type, ornaments and cuts or working from hand-cut linoleum blocks (students provide). Create stationery, tags, gifts or whatever you wish. Students will be instructed on basics of setting type, creating a "form", mixing inks, and printing basics. The second half will be open for students to create and print. Size limits apply. I'm reading: Workshop Schedule for Fall 2014Tweet this! Nice post, This is really great and informative post.. Thanks for sharing information.Your blog is awesome.. I enjoying your post. Excellent article.. Thank you so much! Thanks for the excellent information and facts, this was a very good piece of writing.